PRISMA is a project that features enhanced/visualized contemporary flute music. Full project description (pdf, 6.3MB). 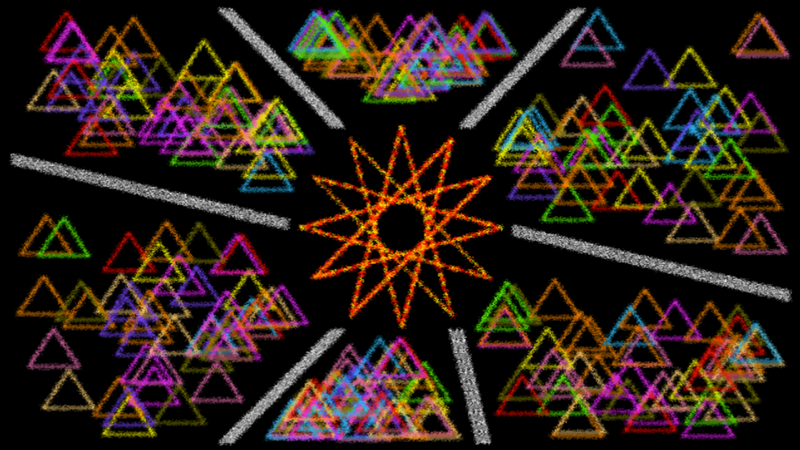 PRISMA is a project that features enhanced/visualized contemporary flute music. Multimedia setups (audio and video electronics, live electronics, projections, light creations...) add an innovative layer to the flute repertoire and augment the absorption level for the audience. The main purpose of the project is the creation of an artistic and versatile language, able to explain or translate the music with some kind of graphic notation, or to expand the dynamic range and expressivity of the main piece through image and light installations. The project has been conceived by the Greek flutist Kalliopi Bolovinou and the Belgian composer and pianist Jasper Vanpaemel. Kalliopi Bolovinou, after her classical studies in Athens, Belgium and Paris, has expanded her knowledge/experience in the contemporary field mainly through her studies with the Ictus ensemble in Gent few years ago and her collaboration with the ensemble Multilaterale in Paris during the recordings of the music of Jacques Lenot at IRCAM and other concerts. As a musician she is always searching how to bring originality into performance and regarding the contemporary music, how to make it more accessible to a larger public (that will not necessary have knowledge/connection with this kind of music). One of the inspirational points for the conception of the project has also been the discovery of her synesthesia while studying in Gent and her personal research on this field. Her mind translates everything in images and it is very intriguing to bring that into life through this project. Jasper Vanpaemel has become a professional musician after studies in Brussels and The Hague. So far he’s been creating around 25 compositions, each of them for different kind of set-ups. As an acoustic and electronic trained composer, he investigates just like Kalliopi how to translate contemporary art/music into concepts designed for a large public, without harming the inner core of the aesthetics. In this project, Jasper will be in charge for everything “enhanced”, being it the creating of the multimedia set-ups (both hardware & software) or the construction itself. Our first objective will be to create and construct a unique framework. In short, the stage becomes a geometrical house for the performer in the shape of a Prisma, some kind of pyramid with transparent drapes. By using the different planes as a projection screen and enhance the area with light installations, we’ll create a lively and expressive dimension and offer a multi-sensory experience to the public, which will be seated around this construction. We developed two set-ups based on well-known flute repertoire. The first one was an adaptation of Luciano Berio’s Sequenza I, combined with Yan Maresz piece called Circumambulation. This try-out project premiered at the Onassis Cultural Centre in Athens, Greece in May 2018. In 1958, Luciano Berio started a series of rather short pieces for solo instruments called Sequenzas. First instrument was the flute. This Sequenza I is considered as one of the masterpieces of contemporary solo flute. The piece is famous for its virtual polyphony, this means creating a harmonic texture through a single melody line. Like many works of Berio’s earlier period, the ground material is based on a serial- influenced language, lots of virtuosic challenges, contrasts and chromaticism. Berio’s flexible proportional notation in the first edition allows a certain freedom to the performer, who can control the narrative of each phrase. We will add another visual layer to the piece. 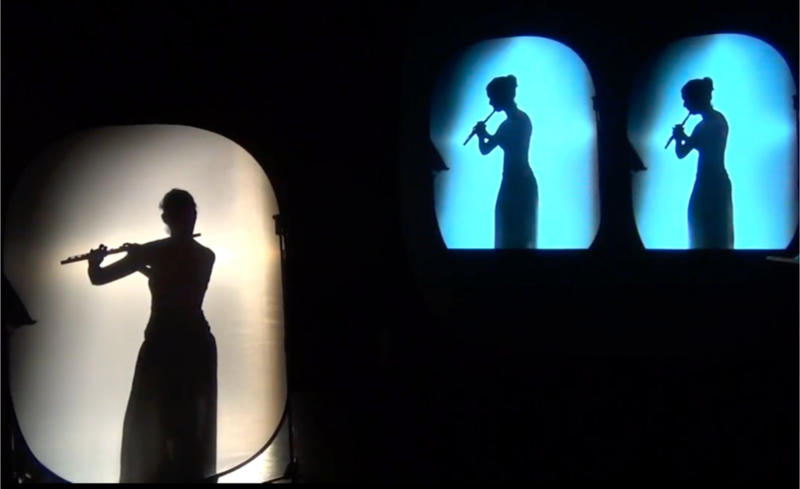 By using shadows (the flute player performs behind a screen and only her shadow is visible to the audience) and other reflections, we create a certain distance towards the audience. The loss of direct impact is compensated by the augmented illusion effect. Therefore, it develops another factor of indetermination, which will, in the end, transform the piece towards a whole new dimension. From this atmosphere, we’ll start our way back. The multi-layered complexity will dissolve into a single pulsation, which will be the starting point of a new piece, Circumambulation from Yan Maresz. Circumambulation, written, in 1996, is a short piece for solo flute that is built on the polyphonic perception of a monophonic instrument. A repetitive percussive element is put together with a more traditional melodic line, creating thus a juxtaposition of two contrasted musical materials. The duality of the rhythm and melody is constant through the work. The performer has to overcome the challenges of both rhythmic accuracy and contrast of the two “voices”. For this piece we’ll add a visual component, trying to highlight all the different aspects of the score, to augment the absorption level for the audience. 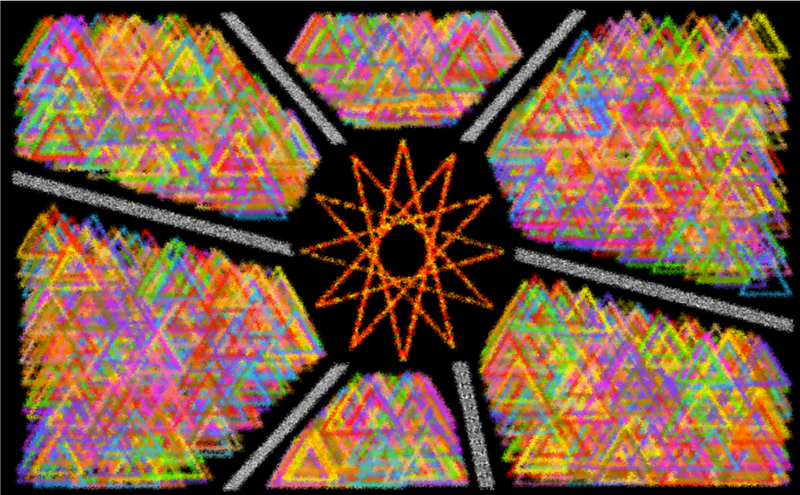 It is based on intuitive & geometrical drawings, a kind of music graphic notation, intended to create a certain language according to different motives and other sonic elements.